Seems everybody has a taste for salt. 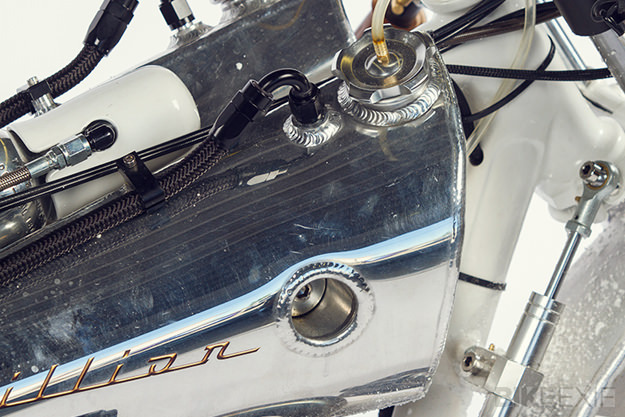 Professional builders and home tuners alike are increasingly constructing machinery aboard which they hope to break speed records, racing only the clock on the Bonneville Salt Flats. Derek Pauletto of Trillion Industries in Calgary, Alberta has never been one to attempt something easy. He tends to really think about what he’s doing—whether machining and assembling finely detailed Star Wars light sabers for his kids, or building a single-sided swingarm for a 1971 Honda CB500. So, when he decided to focus his energy in crafting a racer for the motorcycle-only BUB Speed Trials, he challenged himself. Derek has one foot firmly planted in the modern motorcycle camp, with the other in the vintage camp. 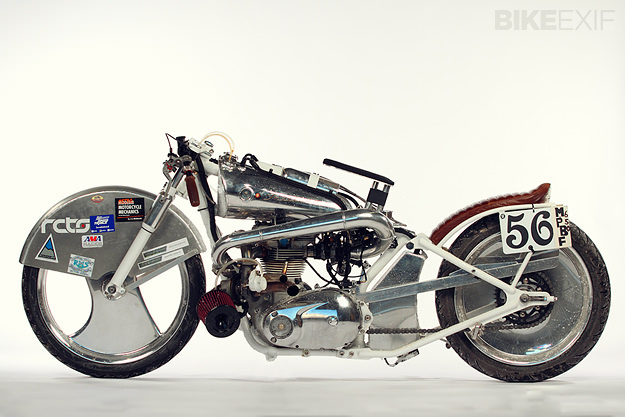 For this build, he reached back to the late 1930s, bringing Edward Turner’s parallel twin engine technology kicking and screaming into the 21st century with the addition of a turbocharger and fuel injection. 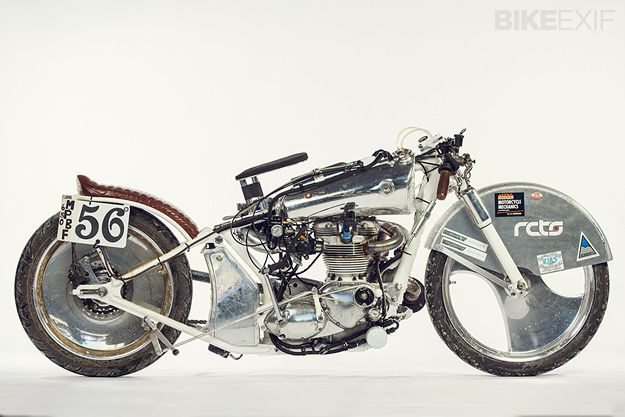 He based the build, which he’s dubbed Raquel, on the remnants of a 1970 Triumph Bonneville. In 2012 Team Trillion ran on the salt in the M/PBF (Modified/Pushrod Blown Fuel) class. 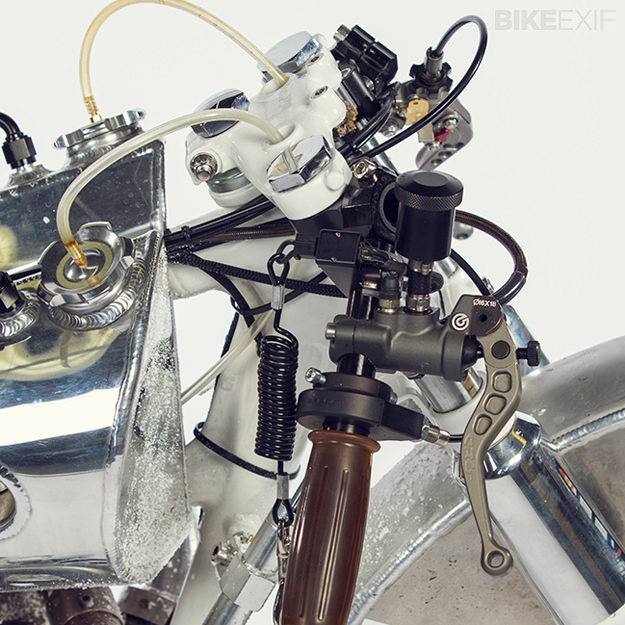 Raquel is based on the Triumph’s front frame loop, fork and engine, but everything was heavily modified. 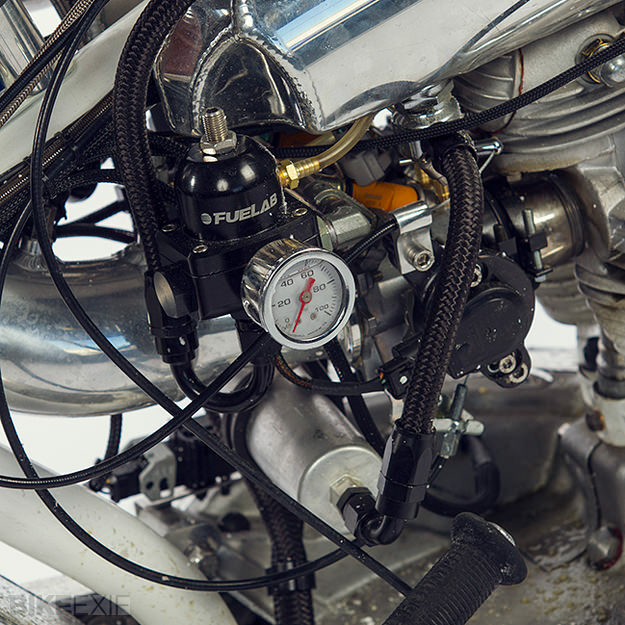 To the 650cc engine—running the standard-spec bore—he installed an aftermarket turbo for a 1.8-L Audi car, and modified throttle bodies from a 2003 Honda CBR for fuel injection. Custom cams, pistons and crankshaft went in, and an HKS F-Con V Pro fuel management computer system was tricked into thinking it was running a two-cylinder Toyota Supra. Derek bent and welded tubes to form the rigid rear, fabricated the oil and gasoline tanks, and machined both wheels from solid billet. With little running time on a local dyno, Derek loaded Raquel and made it to the Sunday tech inspection in Utah. “We were just happy to have made it through tech,” he says. Derek squeezed two qualifying runs (171.94 km/h – 106.838 mp/h and 172.28 km/h – 107.049 mp/h) out of the motorcycle before electrical gremlins left him sidelined. Not entirely thrilled, Derek says he did learn some lessons. He is currently rebuilding the Triumph, wiring in a new computer system and installing a hydraulic clutch and inverted fork from a Honda CBR. “Team Trillion will be back at Bonneville in late August,” he says. Images courtesy of Kurtis Kristianson of Spindrift Photography.